Genetics and Beyond: Bloody confusion! We are back again! Sorry for the delay. 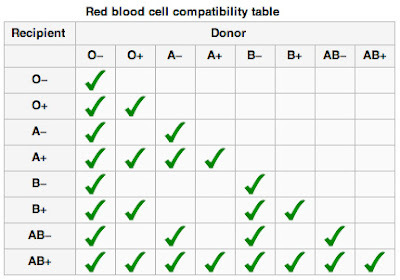 Let me compensate you with a very useful explanation about blood groups and compatibility. The eternal confusion. Am I universal receptor? Who can donate blood to who? There exist two different human blood group systems -actually there are 32, but those two are the most important ones-, ABO and Rh antigen. First of all, all of you should know that the dominance in ABO group is A and B co-dominant and O recessive. It means that if we have AA or AO genotype, the phenotype will be A, if we have BB or BO the phenotype will be B, with OO we have O, and with AB the phenotype is AB. In case of Rh we have positive (+) or negative (-) genotype, the positive is dominant and the negative recessive. It seems quite simple. A and B are not very kind with each other when they are alone. The red blood cells with phenotype A have antigens of A in their surface and antibodies against antigens of B on the plasma, and vice verse. The confusion now comes with the antibodies and antigens definitions. The easiest summary is: antigen on the blood cell surfaces are well treated by the body, antibodies against an antigen detect this antigen and kill it mercilessly. Also, the Rh - can donate to negatives and positives, but the Rh + only can donate to positives. That moves us to the answers for the main questions. The universal donor is O-, they can donate to everybody... But -there is always a but- they can only receive blood from an O-. In the other hand, the universal receptor is AB+, that can receive from everybody but only can donate to AB+. Lucky ones. Have a look to this maps of distribution of the different alleles A, B, and O all around the world. Really nice differences.